www.ka-t.org • View topic - Head lifting issues solved Permenantly!!! Head lifting issues solved Permenantly!!! Re: Head lifting issues solved Permenantly!!! Also wanted to show some proof and ease some thoughts on the washer issue. 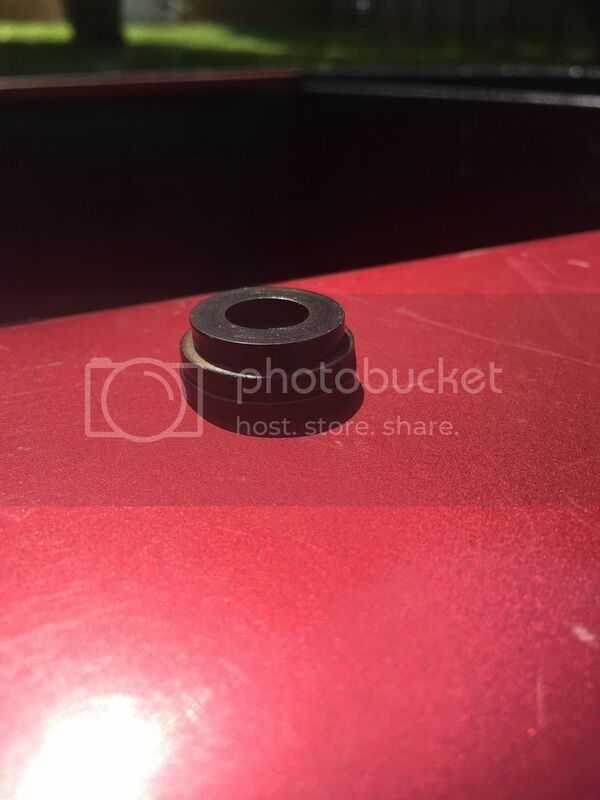 To duncan351's defense his insert washer idea is incredible and I know that it works but after careful research Im certain the bigger issue here is the actual surface area of the washers. The load is just not spread evenly to secure the head with the 10mm washers or 11mm washers that come in standard ARP packaging. This is a visual representation of the washers available. In the picture are three washers. Top: 10mm and 11mm ARP *They are both the same size I matched them up. Middle: factory Nissan washer Bottom: 12mm RB26 ARP washer. As you can see the 12mm washer is just slightly bigger than the factory washer. I can tell you that after installing they barely fit the bosses of my SOHC head. You can see this in my videos posted previously. Hope this helps some of you. The washer fix has helped 2J, VG, 4G63, and RB guys so it hopefully will take care of the KA24. KA24ETZTM wrote: I measured a factory head oil galley hole and the stud to get the difference and determine the diameter needed around the stud. Then I measured the 12mm stud and did the math of what drill bit I would need to maintain that same diameter around the stud as was there with the 10mm stud. what part number used for the 12mm head studs or where did they come from? They are ARP2000 RB26 Head Studs. Got them from Real Street. KA24ETZTM wrote: They are ARP2000 RB26 Head Studs. Got them from Real Street. Thank You! im in the process of doing this to my dual cam. ive been having head lift issues for the past year. now its time to solve it. is yours complete with no oil issues. what did you do about the nuts for rb studs fitting in the hole between the lifters?